It came upon him like a flash. Innumerable little puzzles were instantly solved. He could only wonder that this amazing thing had remained so long a secret to him. He remembered little whispered speeches of hers, so like the Annabel of Paris, so unlike the woman he loved, a hundred little things should have told him long ago. Nevertheless it was overwhelming. "But your hair," he gasped. "One's corsetière arranges that. My friend, I am only grieved that you of all others should have been so deceived. I have seen you with Anna, and I have not known whether to be glad or sorry. I have been in torment all the while to know whether it was to Anna or to Annabel that you were making love so charmingly. Nigel, do you know that I have been very jealous?" He avoided the invitation of her eyes. He was indeed still in the throes of his bewilderment. commentary: I have only read one other book by EPO, and that one is called The Great Impersonation. This one is about impersonation in a completely different context - Oppenheim wrote huge numbers of books, but now I am wondering if they are ALL about impostors? Not that I would mind – I do love any book with this plot trope: Josephine Tey’s Brat Farrar, Tana French’s The Likeness, Mary Stewart’s The Ivy Tree. She threw such a look upon him that even he, Sir John Ferringhall, carpet-merchant, hide-bound Englishman, slow-witted, pompous, deliberate, felt his heart beat to music. Perhaps the Parisian atmosphere had affected him. He leaned towards her, laid his hand tenderly upon hers. This leaves quiet artistic Anna to take on the persona of the wild adventuress. You can probably predict many of the situations and plot turns she will find herself in: it is all tremendous fun, though deeply judgemental. You are never in doubt as to who is the bad sister, and there is not really much element of them learning from each other. I have not discovered how to earn money. I am determined to fight my own little battle with the world--there must be a place for me somewhere, and I mean to find it. Afterwards, it may be different. If I were to marry you now I should feel a dependent being all my life--a sort of parasitical creature without blood or muscle. I should lose every scrap of independence--even my self-respect. However good you were to me, and however happy I was in other ways, I should find this intolerable. -surely surprising views for 1904. “I do not believe that there has ever lived a really great actress whose moral character from the ordinary point of view would bear inspection." It is one of God's laws that a woman may defend her honour, even with the shedding of blood. His views seem to be a strange mixture of Saki and Elinor Glyn. There is even a touch of Ouida (blog verdict: ‘I have a very high threshold for tosh of a certain kind…But Under Two Flags is just TERRIBLE.’ But I had good fun writing about it). All that said, Anna the Adventuress does make for a splendid easy read, with some great scenes. There is an excellent connection with one of my favourite books by one of my favourite authors: Agatha Christie’s Man in a Brown Suit – I am keeping that for another post this week. I'd like to thank Barb over at Leaves and Pages who first put me on to the book. 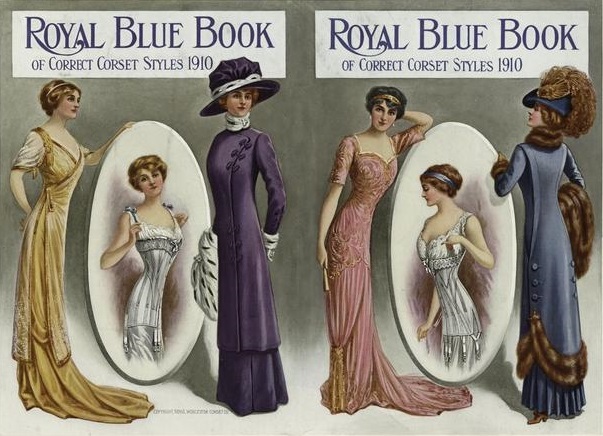 The demonstration of corsets and dresses is from the NYPL and dates from 1910. ….the wonderful poster which had helped to make "Alcide" famous. He had looked at it before without comprehension. To-night the subtle suggestiveness of those few daring lines, fascinating in their very simplicity, the head thrown back, the half-closed eyes--the inner meaning of the great artist seemed to come to him with a rush. Although this one doesn’t at all fit the description in the book, I was determined to use the picture. 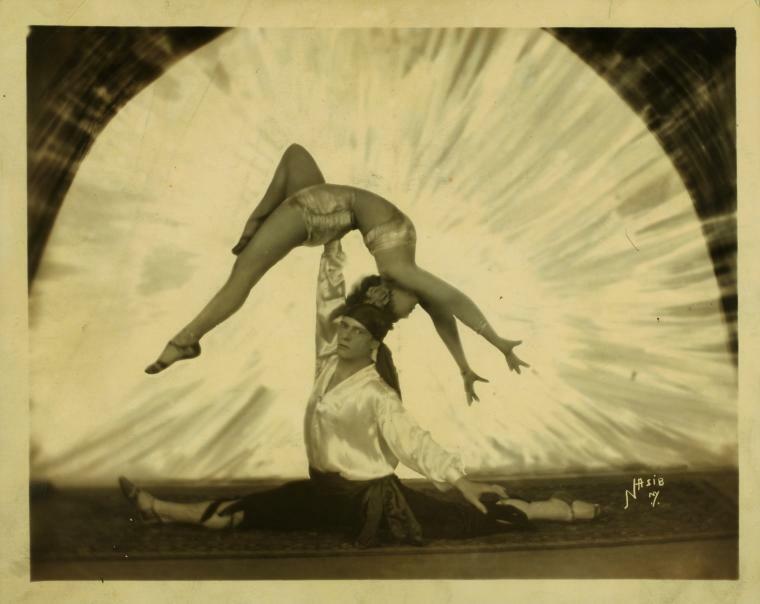 And I suggest you look up Eltinge and Vernon: Julian Eltinge was ‘the King of Drag Queens’. The picture is of adagio dancing, also worth checking out on Google. I cannot resist those plots, Margot. Even though it would surely be impossibly difficult in real life, I enjoy the moments of tension, the wrong words, the difficult questions. And yes, worth it for the take on life. It does sound great fun. One of those books where you just have to suspend judgement and go it. And that photograph . . .! I think that's exactly right: worth it for the fun. And the joy of finding a good photo! There's one set circa 1900 where an attractive woman on a ship bound for Florida makes friends with a plain girl who's on her way to marry a pen-pal. Woman A gets rid of woman B, takes over her identity and belongings and marries the man who's waiting for her on the dock. He falls madly in love with her and they go and live in a new Edwardian house in a new development. She keeps up the pretence, but carelessly lets her canary die of neglect. Plus he comes home one day to find her lounging around smoking a cigar. She runs away, but he catches her up and says "I don't care what you've done - it's you I love." I'm afraid I lost interest at this point. I thought it was called something like Dancing in the Dark, and was by James M Cain, but can't trace it. Well that does sound splendid. Do please track it down and let me know! Yes, start with that one. Not very noir, but entertaining. Turns out I have read something by him - The Evil Shepherd - a few years back for Rich's Crimes of the Century thingy. Just went and looked up your review, blast from the past! Used to really enjoy trying to find something to fit Rich's meme, I miss that. Anyway, as I said in my comment back then - love the cover of Evil Shepherd, and you do make it sound entertaining. I could do worse than look out for that one, I like his ridiculous style. Same for me, I have been intending to read The Great Impersonation, but never ran into a copy. I don't know about this one, would probably depend on how I like The Great Impersonation.